Group picture of the participants and organizers of the seminar. Philippine Deaf Resource Center (PDRC) in coordination with the Zamboanga City Deaf Federation conducted a seminar for the deaf and mute grounded on the discussion of the United Nations Convention on the Rights of Persons with Disabilities Treaty. 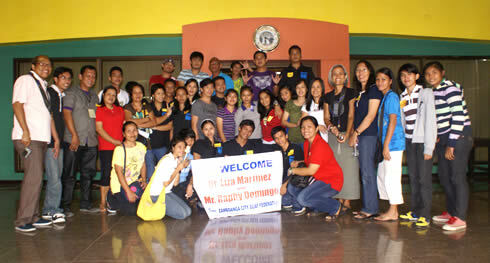 The seminar was held at the Executive Building’s Conference Hall, Western Mindanao State University last April 28. The seminar was a first of its kind touching on the fundamental human rights of the differently-abled individuals in the city. There were twenty-two deaf and mute who participated in the seminar. Most of the participants are members of the federation. “We didn’t realize the differences in signing and how they would be handling the very unfamiliar and very abstract concepts,” shared by Dr. Liza Martinez, PDRC Director. Dr. Martinez gave her remarks as to how the participants took in the new concepts and ideas and she also gave her view on the situation of the deaf-mute in the city. “I’ve seen how intelligent they are. They are a little bit shy at first. They’re very aware of their environment. As we talked about the principles of human rights, you could see on their faces that they appreciated it,” she said further. Dr. Liza Martinez was the speaker during the event along with Raphael Domingo, PDRC Deaf Liaison.